A weight vest is a piece of exercise equipment, usually made of canvas or other durable material, designed to carry extra weight that adds to the wearer’s body weight. Weight vests are commonly used to increase the resistance of bodyweight workouts -- such as squats, pull-ups and pushups -- but they can also be worn throughout the day to help the wearer burn more calories, grow stronger bones through increased load-bearing and build muscular strength and endurance. Start off your vest-day training with relatively low weight. Weight vests come in a variety ranging from several pounds to over a hundred, and some have predetermined weights while others are adjustable. Because you will be wearing it for long-term exercise, it is a good idea to follow the 10-percent rule by starting with 10-percent of your body weight and only increasing the resistance by 10-percent each week. For this purpose, adjustable weight vests serve best. It is also a good idea to get used to the vest and test the weight by wearing the vest during shorter exercises. Most people, especially when just beginning to use a weight vest, want to prepare for this day-long workout by choosing the right apparel. Footwear is especially important because much of the added stress will be on your feet. Beginners should wear shoes with plenty of padding as well as ankle and arch support, especially if prone to injuries like plantar fasciitis. For those who have trained their feet for minimalist shoes, the vest challenges the strength and balance of foot muscles, like the abductor hallucis. Because weight vests can be bulky, plan to wear loose-fitting clothes. 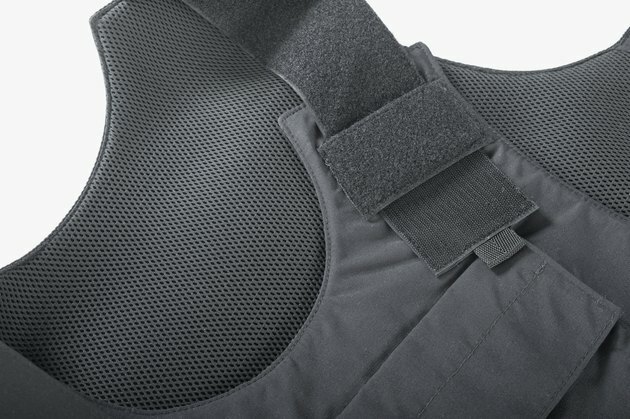 A weight vest can be an effective weapon in the fight against the sedentary lifestyle led by almost half of Americans. As you progress through daily activities, the extra weight will not only increase the difficulty of normal movements, like standing and walking, but also keep you more focused and aware of your body’s movements. Throughout the day, take advantage of the added weight by walking more, climbing more stairs, doing small workouts like pushups, chair dips and squats. In general, take it as an opportunity to keep moving, which will tire your muscles and burn more calories. Wearing even a light vest for a whole day is likely to cause soreness, tiredness and muscle-burn in your shoulders, neck, lower back and legs. This may be precisely what you’re after, but remember that safety is paramount. If any muscles or joints start to hurt, take off the vest. Do half-days if needed and build up your timing and weight slowly. Make sure you keep a straight, neutral spine all day, especially when sitting or bending over. It is a good idea to consult your doctor before using weight vests, especially if you have special problems or concerns. FitDay: What Is a Weighted Vest?